The big money-spinner for Moto Guzzi these days is the ‘new’ V7 range. But although the V7 has put the Mandello Del Lario factory on a secure footing, the heart of the bike is nothing new. 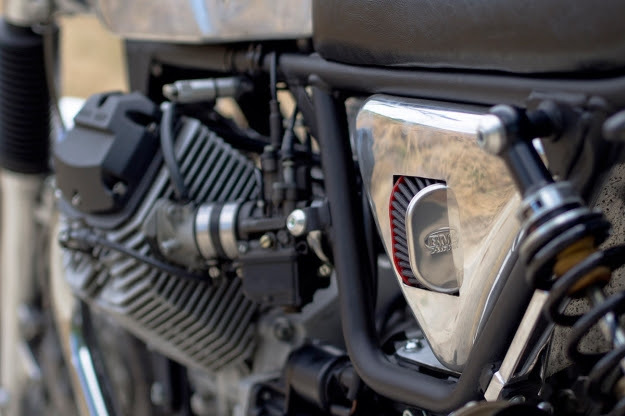 The iconic 750cc ‘small block’ engine design can be traced back to the mid-sixties. The V7’s appeal largely comes from its retro styling, which has elevated it above two close cousins: the somewhat anodyne Breva and the cruiser-ish Nevada. Both are competent bikes, but have hardly set the motorcycling world alight. 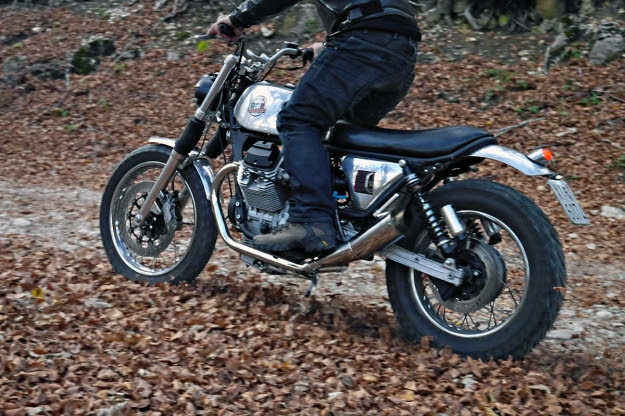 Which makes me wonder: has Moto Guzzi missed a trick by not building a scrambler variant? 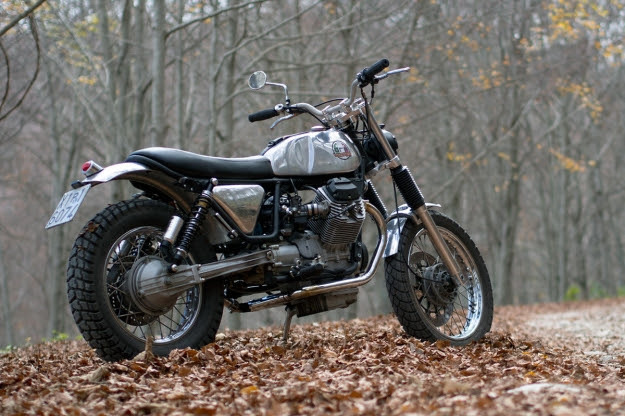 When this delightful custom scrambler landed in my inbox, my suspicions were confirmed. Until recently, it was the personal ride of Officine Rossopuro founder Filippo Barbacane. It’s based on the Nevada platform, and it’s powered by the same small block engine you’ll find in a V7. Massaging a Nevada into the scrambler style is tricky, but not beyond the capabilities of a competent builder like Barbacane. The rear end of the frame is new, as is the beguiling all-aluminum bodywork. The electrical system is now hidden in the tank, and the overall theme is one of simplification, from the controls on the new bars to the compact lighting. There’s a custom two-into-one single air intake, with the filter projecting out of the side panel. The custom exhaust is also two-into-one, and despite running under the engine, suits the style of the bike perfectly. 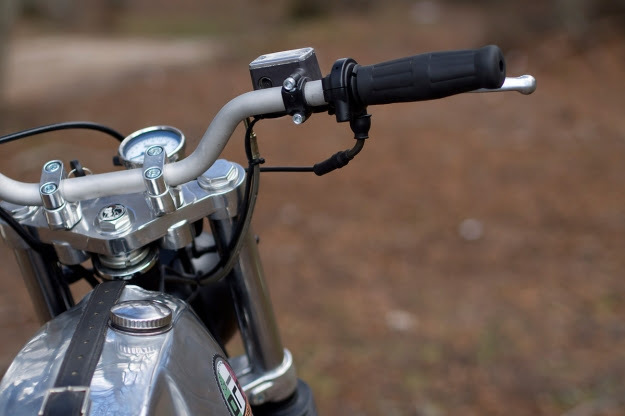 Barbacane designed the bike to be effective off-road, so he also upgraded the shocks to Bitubo items for better control. Best of all, he’s cut the weight down to a mere 150 kg or so. Not quite motocross levels, but light enough to provide an entertaining ride. Especially when you factor in the renowned tractability of the Moto Guzzi small block V-twin. I’m sold on the concept, and could see this machine parked next to the V7 in my own garage. 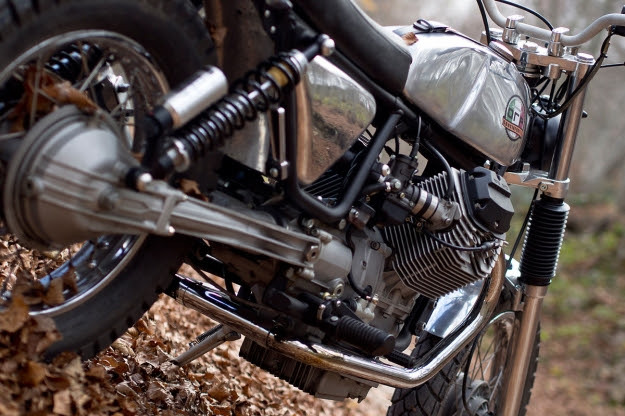 Perhaps it’s time Moto Guzzi built an official V7 scrambler, to compete with Triumph’s popular offering? The post Guzzi Nevada custom scrambler appeared first on Bike EXIF. If you own a Moto Guzzi and live in the UK there’s a good chance that you’ve heard of John, owner of Bristol based Motonero Motorcycles. They’ve been working on and customising Guzzis for twenty years and what John doesn’t know about these old V-twins isn’t worth knowing. Last month one of his builds featured here in The Shed and it went down very well. This latest offering has been built using the rare, spare hours John finds between working on customer bikes, and we’re glad he found the time, this one’s a beauty. The 850 T3 rolling chassis was relinquished by two friends who had tried to complete the project, one of them lasted eight years, the other four. It arrived with badly pitted Suzuki forks and ugly alloy slab yokes but also with the saving grace of a decent alloy fuel tank and seat unit. A pair of 36mm carbs were also present which went some way to sweeten the deal. John set to work narrowing the seat unit and trimming a subtle upsweep to the tail section, later this would be painted a wonderful tone of bronze and have the crisp seat pad fitted. Support is provided by a chopped subframe with a new loop welded in, which looks much tidier from the rear. The fuel tank had its fair share of McGyvering to alleviate beatings from the Suzuki forks, resulting in a good deal of smoothing out being required to make the front indents pretty again, and now the tank resembles a John Williams off-the-shelf version, very pleasant on the eye. Especially with another lick of that bronze paint complimented by the raw knee scoops and top panel, handsome. Black gloss side panels are fibreglass, from Germany and not something John usually fits but these seem necessary and well suited. All of the black bits have been powder coated matt with dark grey accents on the shock springs, brake disc centres and headlight bracket. John might be subtle but he sure knows what he’s doing. The alloy speedo mount is an in-house fabrication, along with the rear light mount. Levers were drilled to add to that ‘going fast while standing still’ look. In fact, if you’re into machining check out the Motonero blog. His mate has done a pretty awesome job of restoring a ’70s manual mill which will no doubt be put to use on the next build. Whilst the 850 engine was in pieces it seemed only right to hot things up a bit and fit 950 barrels and pistons, matched to ported and flowed heads. Seals, bearings, gaskets etc were replaced as required in both engine and gearbox, along with clutch friction plates. The 36mm Dell’Orto carbs work well with the new heads and larger bore, heavy breathing is aided by a new exhaust. Stainless steel headers into reverse cone mufflers, painted black and heat wrapped, all suspended on custom bracketry sitting neatly behind the tasty Tarozzi rearsets. A Dyna III ignition and coils provides the bang and is fed by an all-new wiring loom with modern waterproof connectors. If your Guzzi is feeling a little tired and in need of some TLC or a full custom job, give John a call. Maybe turn up with a project bike and a fistful of dollars and see if you can pry this one out of his hands…. Head to Motonero for more info and contact details or see more on The Bike Shed.